Time to catch-up! Last week was slow because I was so busy planning some new projects and getting the family settled into our new routine with the girls in “school” regularly. I’m going to hold off on photos of the laundry room for a moment because its in complete mid-project shambles and is nothing to look at right now. While I’m waiting for supplies to finish that project, I picked up a couple of cute shadow boxes at Hobby Lobby while shopping for another project. I’d been wanting to do this project after seeing it on a blog or Pinterest some time back, but wanted to find interesting shadow boxes because I’m very over the plain-black-and-sometimes-white options. Things that attract me have interesting shapes and silhouettes. These fit the bill. I picked some keepsake clothing from each child that reminded me of them as babies most. For Chloe, it was the teeny tiny onsie that my mom ran out to buy our first day home when she was so tiny that she swam in newborn clothes. Or Cora, who received mostly hand-me-downs, it was a dress that I bought special for her for our first family portraits with all four of us. I also included an accessory. For Chloe, the one and only personalized burp cloth that she received made by one of Jason’s cousins. For Cora, it was her hospital hat (I didn’t think to grab Chloe’s). 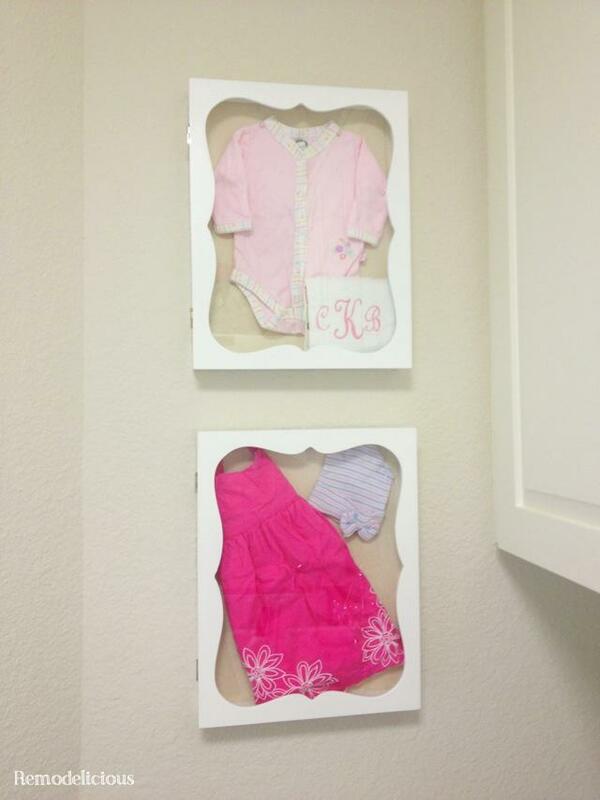 I wanted to include their first shoes as well, but the shadow box wasn’t deep enough and smashed them. These turned out really cute just keeping it simple with a couple of items. I can’t wait to have the laundry room ready to photograph, but it’s been slow moving since we have several projects going on right now including the girl’s new play area in the yard which is our main priority right now.